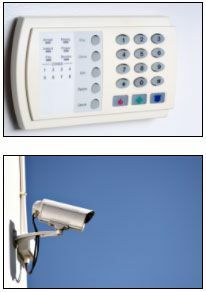 Burglar alarms are designed to prevent intruders from breaking into your home and property. At Safe and Sound Security, we offer a range of options to best suit your requirements and circumstances. We are a family run business that was established 26 years ago and are based in Central Chorlton, just 2 miles south of Manchester City Centre. The primary goal of a burglar alarm should be to prevent the potential intruder from gaining entry to your premises. This can be achieved by fitting seismic detectors to accessible windows and doors, especially around the rear of the property where roughly 86% of break-ins occur. These devices are effective at stopping the attack by cleverly detecting high frequency vibrations caused whilst the burglar is attempting to force a window or door, consequently triggering the alarm system sounders. Our systems have twin piezo sounders externally and a powerful internal sounder. Continuing to attempt to gain entry to the premises at this stage is no longer an option and rather than be spotted they will leave the area forthwith. A system with only contacts and internal movement detectors will not prevent unlawful entry into your premises. By the time the burglar has gained entry they will have caused a great deal of damage and often attempt to destroy the alarm system. They will then usually grab what they can and leave. This type of detection is usually offered only as a very basic/ budget system. We at Safe and Sound Security take pride in the fact that due to our emphasis on perimeter protection we have helped to prevent scores of people from becoming victims of crime. Call us today to discuss which intruder alarms are best for you to help protect your home. From small residential observation systems to large scale multi-channel high resolution systems that can store images for prolonged periods and are able to be remotely viewed via the internet or from your mobile phone, we offer a number of CCTV Security Systems. We also offer bespoke covert systems where a conventional CCTV system would struggle to produce the type of images required for evidence. This type of system is excellent for capturing full face images, which the Police find very helpful and sometimes invaluable. Alternatively, you can also fill in the contact form with your details and query.